Inspiring Bella Crafts: June 6 Challenge Things with Wings. This week the challenge is things with wings. This could be anything from bugs to fairies, of which I love all, but dragonflies are my favorite. So this image was a really easy choice for me. I love the way dragonflies are shaped the variety of colors that they have they are magnificent. Plus with the loss of someone that was very dear to my heart a friend had told me to goggle the story of the dragonfly. So I got on the Internet and found the story, wow brought tears to my eyes. The story is basically comparing the growth of the dragonfly from a larva to that of a loved one going to heaven. The dragonfly larva never understood why every once in a while a larva would grow into a dragonfly and leave the pond. Every time one left they would say how they would come back to tell everyone how wonderful it was and what happened on the other side , but no one did. The larva turned into dragonflies and could not return to the water to tell all his family and friends what happened. Just as when we loose a loved one they can't come back and tell us how wonderful it is on the other side. This also is my favorite movie title, it has Kevin Costner in it and is called Dragonfly a truly wonderful movie. I truly love both of these stories, if you have ever lost someone this story is worth looking for. 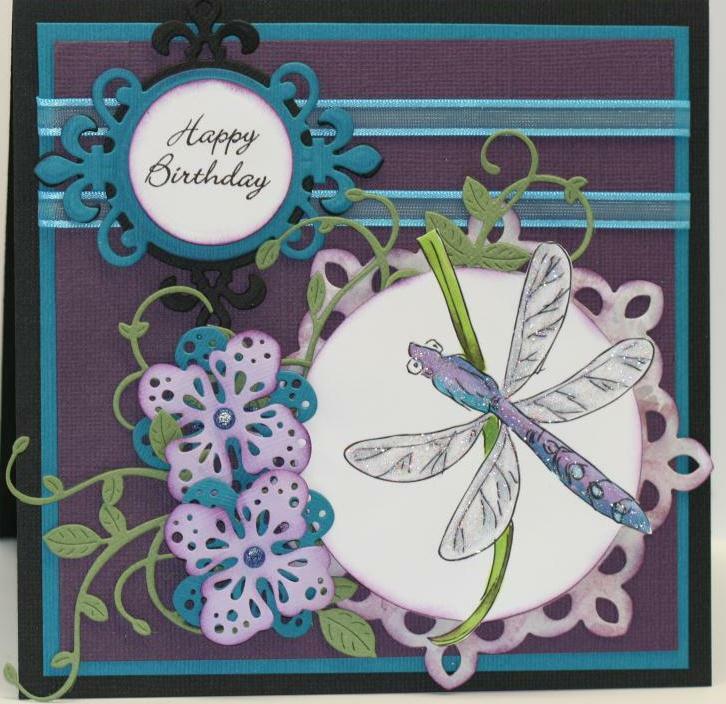 So this is my creation using my most favorite thing -- The dragonfly. 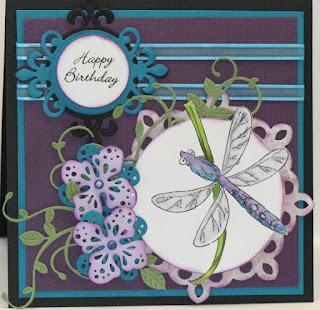 This image is from Whimsy Stamps and is by Liastampz called Dragonfly. You should hop over to the Whimsy Inspiration challenge as well to check out all the wonderful creations from all the other Dt's. A closer look at my image colored and with stardust stickles on it cause you know how dragonfly's shine. 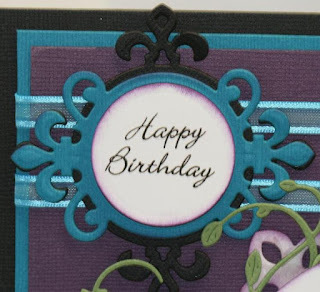 A closer look at the Magnolia Doohickey flower dies. This is made with Spellbinder Fleur De Lis Motifs and Accents. Supplies: Whimsy digital image Dragonfly, Bazzill cardstock, Spellbinder Fleur De Lis Accents and Motifs, Whimsy Vine Die set, Technique Tuesday stamps, Ranger stardust stickles, ribbon. You made me cry . I love this and the story you told, wonderful job friend..Very pretty!